Many seniors know the benefits of exercising the body, but there are many good reasons to encourage your mother to exercise her brain as well. With dementia and cognitive decline becoming major concerns in senior well-being, learning to improve brain health is as important as ever – and one of the best ways to help your loved one get started is by having them play memory games for seniors. Researchers at Harvard and Stanford universities as well as the University of California, Berkeley, have all used Lumosity, an online memory training program, in their studies about cognitive decline. The designers of the game site state that 97 percent of participants can improve their memory after just 10 hours of Lumosity play time, according to ABC News. To personalize the games chosen, each user is asked questions that are specifically geared toward cognitive processes to find their strengths and weaknesses. This is one of the most popular brain training games for seniors, as it allows individuals to differentiate patterns using problem solving and logical processes. As we get older, our senses may dull because we become used to solving the same types of problems over and over again. This can cause the brain to become “burnt out” or stagnant. 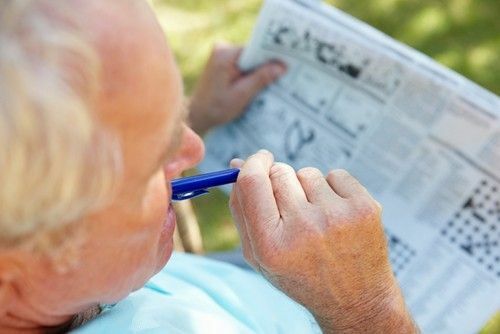 With Sudoku, new deductions can be made because the brain uses synapses that allow seniors to fill in gaps. It’s a very simple and easy-to-understand game that almost anyone can pick up, which could also account for its popularity. This timed memory game for seniors, which is available for free on the AARP website, tests memory and language skills by listing a series of definitions and having players come up with the right term. Although it may sound simple enough, there are many definitions that could relate to multiple words. After going through several definitions, your mother will then be instructed to recall the words that were given, whether or not he answered the questions correctly. If your mother likes more traditional memory games, that’s OK too. There are several great tactile games that help improve memory and cognitive skills. Even if she can’t solve the whole puzzle in one sitting, setting aside some time to work through several clues can help jog her memory and keep his brain balanced. Likewise, word searches can also foster short-term memory skills and increase his analytical processes. The key with any memory game for seniors is making it a daily habit. Because our neurons tend to dull over time, it is essential that these games are played on a regular basis to see the best benefits. Check in with our Life Enrichment team at Aegis Living to learn about all of the options provided for our residents.